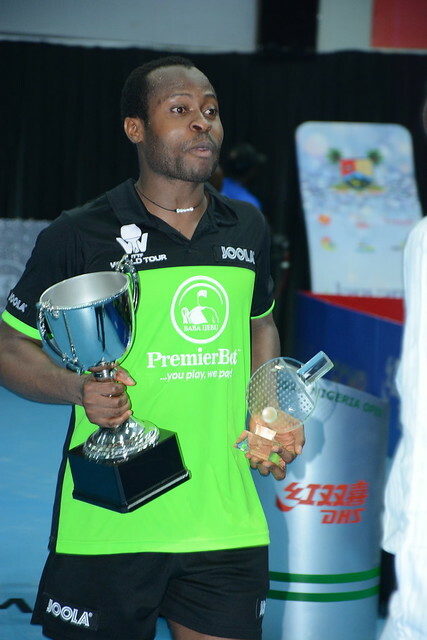 Places in the second round booked the previous day but for Olufunke Oshonaike and Cecila Akpan, there was to be no further progress in the Women’s Singles event at the 2018 ITTF Challenge Seamaster Nigeria Open in Lagos, as the host nation’s hopes came to an end. On the late morning of Saturday 11th August, both experienced defeat. Cecilia Akpan, the no.16 seed, was beaten by Hungary’s Szandra Pergel, the no.2 seed (11-4, 11-7, 9-11, 12-10, 11-4); Olufunke Oshonaike, the no.8 seed, experienced defeat against Fan Siqi, the no.12 seed (11-2, 11-5, 11-6, 8-11, 12-10), a round in which China, as in the previously, stamped its authority. In addition to Fan Siqi, colleagues Guo Yan, Qi Fenjie, Sun Chen Wang Shu and Wei Wensheng enjoyed second round Women’s Singles success. All required to compete in the two day qualification tournament, Guo Yan accounted for Luxembourg’s Sarah de Nutte, the no.4 seed (11-5, 12-10, 11-6, 7-11, 11-7), Qi Fenjie defeated Italy’s Debora Vivarelli, the no.5 seed (11-8, 11-5, 11-8, 11-5). Likewise, Wei Wensheng overcame Slovenia’s Alex Galic, the no.6 seed (11-7, 11-3, 11-7, 13-11); Sun Chen beat Colombia’s Paula Medina, the no.7 seed (11-7, 11-9, 7-11, 11-2, 13-11), whilst Wang Shu ended the hopes of fellow qualifier, India’s Sreeja Akula (11-5, 7-11, 11-8, 11-2, 11-9). Success after success for qualifiers but just as with Szandra Pergel and Fan Siqi, Thailand’s Suthasini Sawettabut, the top seed, stood firm; she beat Norway’s Ilka Doval, the no.9 seed, to reserve her last eight place. At the quarter-final stage Suthasini Sawettabut meets Wei Wensheng, Qi Fenjie opposes Guo Yan; in the opposite half of the draw Wang Shu confronts Sun Chen, Fan Siqi plays Szandra Pergel. The matches are scheduled to be staged later in the day in the evening session of play.